Pistorius Case Dealt 'Serious Blows'; Detective Faces Own Shooting Charges : The Two-Way The Olympic and Paralympic sprinter is accused of murdering his girlfriend. In a court Thursday, it was revealed that the lead investigator himself had been accused of attempted murder in an unrelated case. That added to questions about the prosecution's case against Pistorius. 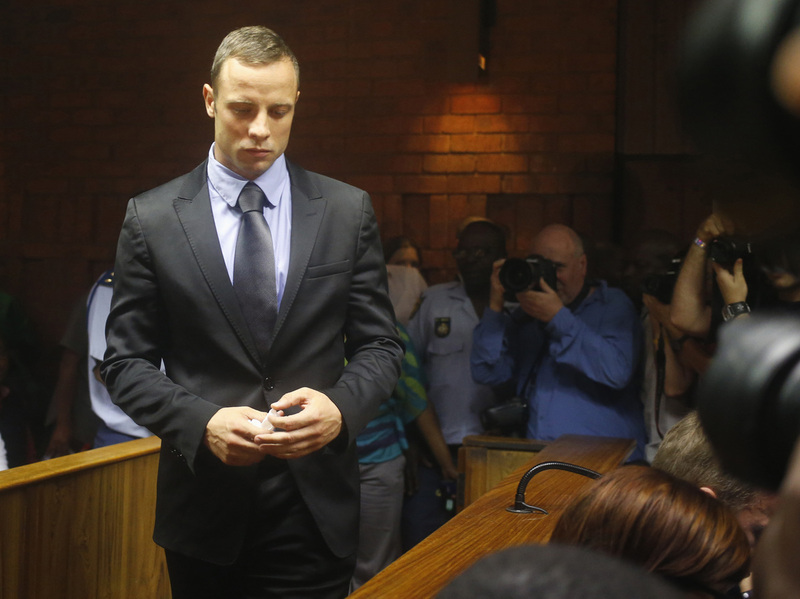 Oscar Pistorius as he entered a court in Pretoria on Thursday. A new lead investigator has been appointed in the murder case against South African athlete Oscar Pistorius, The Associated Press reports from Pretoria. That announcement follows the news from earlier Thursday, as we reported below, that the detective who had been in charge of the case faces attempted murder charges of his own stemming from a 2011 shooting incident. The murder case against South African athlete Oscar Pistorius was "dealt serious blows" on Thursday, as The Guardian puts it, when it was revealed in court that the lead investigator faces attempted murder charges himself. They stem from an unrelated incident in 2011. Detective Hilton Botha, prosecutors told the court, faces seven charges of attempted murder. He and two other police officers are accused of firing at a "minibus taxi loaded with passengers," the Guardian adds. They were allegedly drunk at the time. 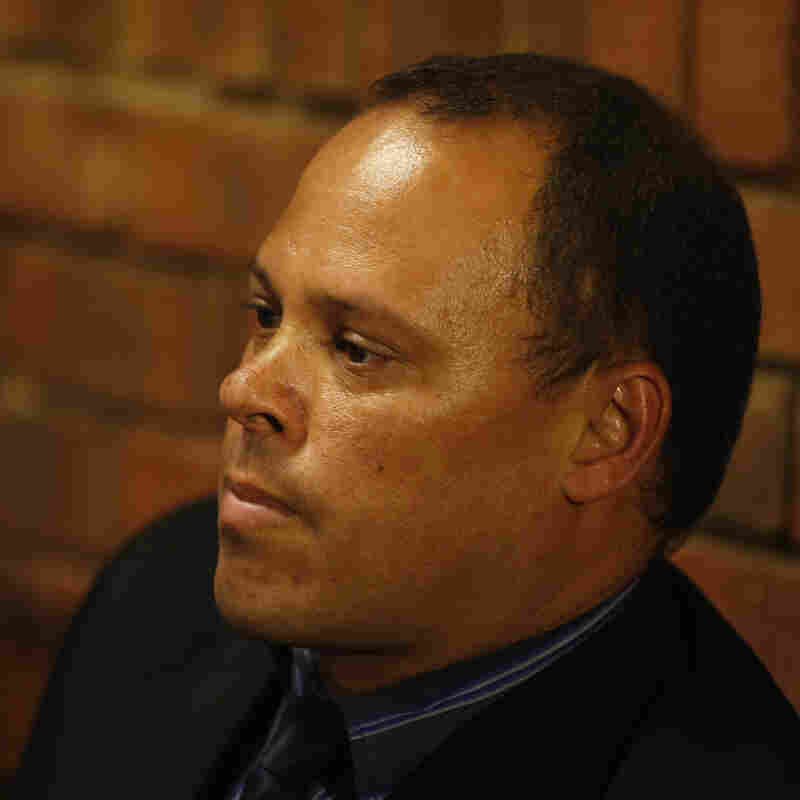 Prosecutors said they had not known until Wednesday about the charges against Botha, reports South Africa's News 24. As The New York Times writes, "the disclosure seemed to present one more setback for the prosecution's efforts over days of hearings to deny bail for Mr. Pistorius." The Times adds, though, that "South African news reports said the 2011 shooting happened when the officers were pursuing a man accused of murdering and dismembering a woman before putting the body parts into a drain. ... Mr. Botha was quoted in South African news reports as denying claims that he was drunk during the alleged shooting. He said he and other officers had aimed at the wheels of the minivan without causing injuries." The 26-year-old Pistorius, known as the "blade runner" because of the carbon-fiber prosthetic legs he uses, is the first double amputee to have participated in a Summer Olympics and is a Paralympics champion. He's accused of premeditated murder in the Feb. 14 shooting death of his girlfriend, 29-year-old Reeva Steenkamp. Pistorius says it was a terrible accident — that he thought there was an intruder in his home and that he fired four shots through a closed bathroom door after shouting at the person to leave. -- The defense has gotten Botha to concede that he's unsure about how far away a witness was from Pistorius's home. That witness, investigators say, heard shouting that lasted for at least an hour before the sound of gunshots. -- The defense has gotten Botha to concede that he is not certain it's testosterone (as he first testified) that investigators found in Pistorius's home, along with syringes. -- The defense has gotten Botha to concede that he walked through Pistorius's home after the shooting without putting protective covers over his shoes. Still, "the prosecution did land some blows on the athlete's character," according to the Guardian: "Botha claimed that Pistorius was involved in another shooting at a restaurant in Johannesburg in January and, aware of the media storm that would ensure, asked the gun owner to 'take the rap' for the incident, which he did." Meanwhile, Nike has now "suspended its endorsement deal" with Pistorius.